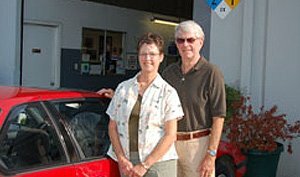 Over the last few years, many of you have heard of Marge and her Toyota Celica. 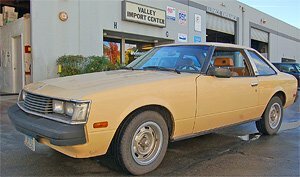 The latest is the car has now accumulated over 572,000 miles – and it keeps going and going… For those that may be new to this story, Marge has driven her 1980 Celica, since new, to and from work – over the Sunol Grade. Marge has had a variety of jobs in the Silicon Valley and it is common for her commute to be 100 miles a day. 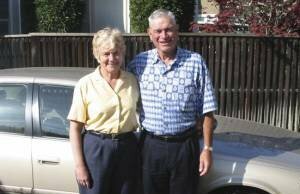 Marge met Ian Cook at the dealership where she bought her Toyota. When Ian set out on his new venture, Marge naturally followed, and the Valley Import Center Team has cared for her Celica ever since. Her secret for the longevity is planning for maintenance. She sets aside a certain amount each month for it, saying it is much cheaper than a new car payment. All of us would like to congratulate Marge and her Celica, who she has named “Babe” and looking forward to the next milestone: 600,000 miles. As an active family with two girls in college and a real estate practice, our five cars are truly an extension of our home and office. 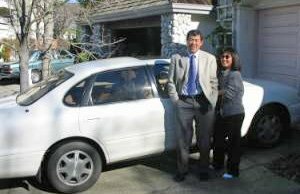 We’re realtors in Contra Costa and Alameda counties, so we put many miles on our cars. And our daughters travel back and forth to college in Southern California regularly. Over the last six years, we have owned foreign and American cars, sports cars, SUVs, trucks, sedans and luxury cars. The only common element in our cars’ history has been our service shops, both owned by Chengdong Sun. 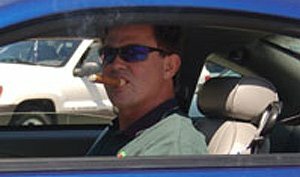 Frankly, we have very little time to deal with auto problems. Because of Sun’s expertise in automotive repair, his integrity and excellent service, our family can deal with our car maintenance easily and with confidence. We use Sun’s shops, Valley Import Center in San Ramon and Sal’s Foreign Auto in Castro Valley, for all aspects of car ownership from purchase advice, to maintenance and deciding when and if to sell. This allows us to focus our attention on our family, our clients and our business. How many people can say that their auto mechanic saved them money? From the point of identifying a new or used car to purchase, we utilize the expertise of Sun’s team to help us make good investments and sound decisions. Recently, we purchased a used Mercedes for our seventeen-year old, and Sun’s mechanic, Leno, in Castro Valley, stayed late to inspect the vehicle, and gave us the information we needed, as we negotiated a great price. We have also called into their shops when we were having a problem, and were able to bring our cars in immediately, or get advice on the phone. Many times, little problems were handled with free advice, or little charge, where other mechanics may have taken advantage of the situation. At first glance, it may appear that auto service shops are alike, or offer a similar service. But as we all know, integrity is an intangible that is difficult to see until you’ve had experience with a business. Integrity is what defines Sun’s shops–a characteristic that surfaces in quality workmanship, commitment to servicing his clients, and in his fair pricing. After a few years of dealing with Sun, we recognized his level of integrity as one that we hold ourselves to when dealing with our clients. Sun’s honest feedback, and great sense of humor certainly add to a pleasurable experience. Integrity and trust are distinguishing factors in dealing with any business, especially one that impacts your safety and involves valuable assets. We would highly recommend both of Sun’s shops to our clients, family and friends. They are definitely part of our “team” as far as businesses we refer with confidence. Valley Import Center and Sal’s Foreign Auto have both earned our loyalty and consistently meet our demanding lifestyle needs with respect to our autos, as well as our high criteria for expertise, integrity and excellent service. Without our customers trusting us with their vehicles, we wouldn’t have stayed in business for the last 25 years. As we celebrate our Anniversary, Bob and Robin Feldman celebrate 25 years of marriage. Together they have two children, Adam & Emily. Since both are drivers, you can say that VIC makes sure that the whole family has reliable transportation to get them through their full lives. Adam is a junior at University of Arizona (drives the 4Runner) and is majoring in Finance. Emily is a senior at San Ramon Valley High School (drives a Celica) and will be attending college in the fall. Hello, my name is Peter. My wife Shirley, our sons Nicolas and Christopher and I make up the Wong Family. Between all of us, we have driven over a million miles amongst our various Toyota and Honda vehicles we have owned since 1980. All of our vehicles have been maintained by SRVIC. Not once have we needed any type of tow vehicle for any mechanical problems. Shirley is the one who usually schedules the needed appointments and her favorite words are “I NEED A TUNE-UP” when she only needs routine maintenance. Shirley also is the one who brings the vehicles in for maintenance. She usually waits while SRVIC does their magic. Shirley remembers the times when she brought Nicolas in a stroller and then pushed him over to the health club while work was being completed. Shirley remembers Chris as a young lad cleaning the shop and his older sister, Claudia helping in the office. Shirley and I both agree that Chris is the BIG MAN now, taking over from what his dad started. We both have come to know Chris a little better and see the value with on going changes his team continues to implement, such as the shuttle service, comfortable waiting area and longer warranty to name a few. SRVIC is the cat’s meow when it comes to the care of our vehicles and the customer service they provide. For almost 25 years we have entrusted them exclusively and never questioned any recommendation they have made regarding our vehicles. Our trust and fate goes beyond SRVIC to family, friends and neighbors. Keep up the good work Chris and Staff; we will be looking forward to seeing you soon. April 7, 1980, at 8 am I drove our Toyota to the newly opened Valley Import Center at the old location on Beta Court in San Ramon. Ian Cook was helping us extend the lives of our Toyotas with regular servicing and constant care. We had brought our first Toyota in 1974 – a Corona Station Wagon. We liked it so much that we bought another Corona Wagon in 1975. With two children playing junior tennis, we drove those Corona Wagons every weekend from Fresno to San Francisco to Sacramento, to junior tennis tournaments. We had bought the cars during the fuel shortages for gas efficiency but ended up liking them just as much for their reliability. 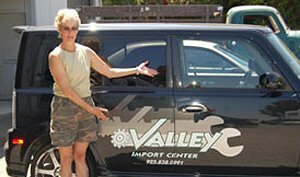 We knew that those cars functioned so well for us – not a single breakdown – because of the constant care at Valley Import Center. We’ve graduated through other Toyotas to Camry’s. But the 1974 Toyota Corona wagon was not turned in for a Toyota Camry Wagon until 1990. By then our son was a professional tennis player and our daughter was working on her PhD in Art History. We still go to Valley Import Center for all our automobiles’ servicing. The folks there are like family! I love Valley Import! Seriously! I especially like working with Jeff. He handles my questions and impromptu drop-ins with “is this a problem?” like a true professional. My husband and I tend to drive our cars for a very long time. Knowing this, a neighbor told us about Valley Import Center. When I bought my used Volvo wagon 5 years ago, I found going to the dealership an unpleasant experience. 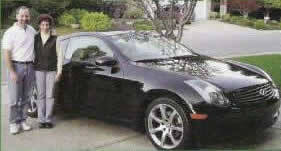 So even though it was sold with a limited warranty, I would drive it in to Jeff to take care of. I trust Valley Import Center. Even though I’m a woman, I’m treated with respect, which can’t be said of all service shops. And if the guys laugh after I leave, at least they don’t do it in front of me! I have recommended Valley Import Center to friends and feel comfortable doing so. I know that the service they will receive will be exceptional. We keep hauling our cars in there – and Valley Import Center keeps them running… it’s a very nice partnership. We first started going to San Ramon Valley Import Center shortly after Ian Cook opened the doors, following him from the local Toyota Dealership. We have been coming here ever since, except for a Five-year period when we lived in Ventura. In fact, we are now on our third owner. One year, when Judy taught Chris Cook’s son, Ian’s grandson, in the first grade we thought we might have to find another place to service our cars – not wanting the appearance of a conflict of interest, but it all worked out fine. Over the years, there have been many cars – four Toyotas, a Honda Prelude that Judy won’t give up, a couple of Chevy Blazers, and even a Suzuki Samurai, and the service has always been the same top quality. What is needed is done right and if it was not needed, it is not done. Jeff and the other Service Managers keep up to date on our cars and recommend what really needs to be done and what needs to be watched. With family in Southern California, and so many other interesting places to visit, we are always on the go, literally trying to drive the wheels off our cars. Highway 5 in the Central Valley is not a place to have your car stop. We have never been left stranded. It is a comfortable feeling, knowing that your car is in top form and that you do not have to worry. Seven years ago when we moved to Danville, we asked the advice of a friend about where we could have our cars serviced. Paul, who owned a couple of auto parts stores at the time, suggested Valley Import Center. He said that he had never heard anything negative, so we decided to give them a try. At the time, we owned a GM 4.3 Blazer, Mazda Pickup and a Lexus GS300. Our experience with SRVIC has been just as our friend told us; we are very, very happy and always receive great service. Today we have a 2004 Mustang, 2005 BMW 530I, 2006 Toyota 4runner, and 2007 Toyota Solora. All service at SRVIC is professional, and we would not consider going to anyone else. Sun, the new owner, has never missed a beat since Chris sold the business to him. The employees know me as the Bread Man, since I drive for Colombo-French Bread. I drive over 52,000 miles a year just delivering bread, plus another 24K on our personal cars, my driving takes me from Castroville to Reno, and am amazed by all the cars I see that have the Valley Import Center license plate frame on their car. We cannot say enough about the staff, Jeff and Chris are always there a 7:00 AM to greet you and they make sure you are satisfied with the service. Angella is all about CUSTOMER SATISFACTION. 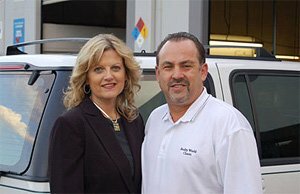 She is smart, quick-witted, and understands the customers’ needs for good quality automotive service. Only suggestion I would like to make is “more rock & roll in their morning music selection.” Keep up the quality of work and friendly atmosphere. We will always be happy and satisfied customers. 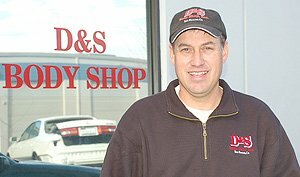 My name is Ken Souza, and I am the owner of D&S Body Shop here in San Ramon. As an automotive shop owner, I fully understand what is required to take care of a car so that it will work well and keep its owners safe. Valley Import Center has great customer service and the people there are extremely knowledgeable and friendly. We use them not just because of their friendly service, but also for their expertise in properly diagnosing the various automotive systems on the vehicle. This is why I use Valley Import Center for all the mechanical needs of our customers’ and personal vehicles. I feel confident in the repairs that are performed and reassured knowing that my wife is driving a car that has been maintained by Valley Import Center. They, like us, understand that a person’s car is more than four wheels connected together by metal. At Valley Import Center, you can have the assurance that you and your car can handle any driving condition.